Maastricht — On the preview days at TEFAF Maastricht (14-15 March 2019), Dr. Jörn Günther Rare Books sold an extremely precious 15th-century Book of Hours, illuminated by the Masters of the Grandes Heures de Rohan (likely the Giac Master in particular). The Masters were possibly a family of painters who may have handed over and reinforced expertise from one generation to the other. Their distinctive style is characterized by a striking experimentation with scale, elongated figures, and a somewhat distorted perspective, together leading to an expressive and dramatic result. Characteristic motifs include long limbs, golden clouds drifting across vividly coloured skies, and fascinatingly layered patterns. They are named after their main oeuvre, the Grandes Heures de Rohan (currently at the Bibliothèque nationale de France), which was created about fifteen years after the Book of Hours that was sold at TEFAF Maastricht. The miniatures in this vividly coloured Book of Hours, including the fine figures of St. John Baptist, the Archangel Michael, or the Burial scene, anticipate the impressive, monumental compositions of the Grandes Heures de Rohan. The Masters’ bold colour choices offer a brilliant precursor to exquisitely colourful works by later generations of painters, such as Vincent van Gogh, expressionist painters like Ernst Ludwig Kirchner, or Jean-Michel Basquiat. 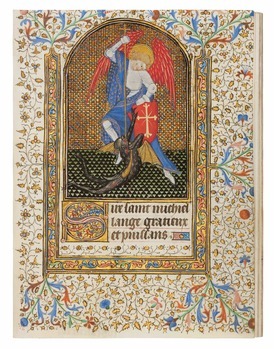 This stunning Book of Hours has been on the market for an asking price of 1,850,000 euro. The manuscript went to a private collector. Dr. Jörn Günther also sold a very unusual, and possibly unique, 16th-century manuscript that consists of eighty illustrated Italian proverbs related to virtues and vices. All eighty images are similarly organised and depict one or more protagonists that illustrate the essence of the saying. The style of the images is simple but quite skilful and charming. In variations, many of the proverbs are still known today. For instance, the manuscript includes 16th-century advice on minding one’s own business - with the image of a man bent forward with the world on his shoulders: “Chi gliaffanni daltrui portar si crede // Si tira il mondo adosso e non si avede. (He who believes he must bear the affairs of others will unwittingly carry the weight of the world on his shoulders).” This interesting manuscript has only recently come on the market and was presented at TEFAF Maastricht for the first time with an asking price of 66,000 euro. It went to a private collector. Another artwork that was bought by a private collector at TEFAF Maastricht is an exquisite single leaf from a deluxe Book of Hours. The full-page miniature depicts the Flight into Egypt. The miniature leaf comes from a French Book of Hours, one of the high-end works of the Dunois Master and his workshop. Meanwhile, a private collector from the US bought two excellently preserved, large leaves from an Italian Antiphonal, illuminated in the circle of Fra Antonio da Monza around 1500. One of the miniatures depicts the Resurrection of Christ in the initial R, the other one the Ascension of Christ in the initial V.
In addition, four highly interesting miniatures went to an institution in Asia. Two leaves from a scroll on vellum come from Peter of Poitiers’s Compendium Historiae in Genealogia Christi (c. 1280), the genealogy of Christ beginning with Adam, which was created in England in the late 13th century. One of them shows a miniature of Alexander the Great, and the other one features miniatures of Moses and Aaron. Another single leaf comes from a 14th century ferial Psalter. The profusely decorated initial S contains a wonderfully detailed image of David in waters and God in heaven - glistening with gold. The fourth miniature that will go to Asia is an illuminated leaf from a 14th century Gradual. The richly gilded initial E features an exquisite portrait of a Confessor Bishop.